My Lawyer and I crashed out a friend’s house on the lake last Friday evening. We woke up with the sun and headed back to his cabin to complete the nap. Futons & couches called us like Sirens…That’s when the agony began. Nat Finn Praying the lawyer’s ex gf comes & gets these Guinea Pigs soon or the bonfire I’m going to tonight’s going to become a pig roast! You, Lisa Gawron and Daniel Timm like this. Daniel Timm Then why aren’t you sleeping? Nat Finn Because I haven’t developed the will to go get the hatchet, yet. Internet reports says they’re delicacies of Peru and taste like the dark meet of Chicken – or the roof of your mouth after you’ve bitten down on your tongue. It’s tough to tell. Seems as though most bloggers who wrote about their guinea pig eating experiences were drunk and needed munchies. Surprisingly, I can relate (I see this conversation stream becoming a blog post). 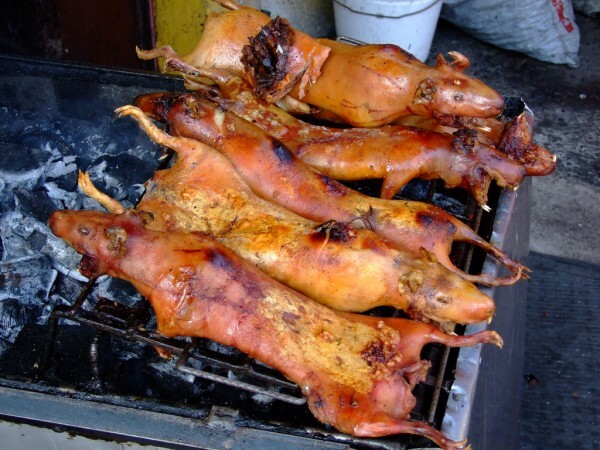 Tony D’Aloisio Guinea pig tastes great roasted over an open flame. In fact I have this spice rub that would go well with the gameyness (?) of the GP. Nat Finn And you will be providing the open flame….m’mmm. I guess we should feed those things so there’s some meat on them bones. Nat Finn Do guinea pigs eat celery? You and Lisa Gawron like this. Patrice Prunsky Nah. They just lick the peanut butter off like the rest of us do. Nat Finn I’m giving away a free case of #gumballhead. How to win? Be willing to take the two adorable guinea pigs my lawyer’s ex-pyscho left him! Aaron Corralez Time for a roast. Nat Finn That’s what I’m talkin’ ’bout! Craig Huchel Bring them to Indy. We’ll throw lawn darts at ’em. Mike Sliwa Better than AR-15 target practice… we can see if they dance.. or moonwalk…. Missi Maynard aww, I would but my cats would eat them. I’d even let you keep the booze. Nat Finn Well, sadly she went and got them. But she put the rest of the stuff in the shed. G a r a g e s a l e time! Douglas Karr Mmm… heard they’re good with BBQ sauce. It is amazing how two little rhodents can ruin the feng shui of a place. Thank God they’re finally gone.